In addition, full event and ticket information can be found at www.ProFootballHOFEF.com. 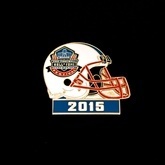 Continuing a tradition first started in 1977, the 2015 commemorative pins are also currently available. This year’s pin is only $5, but it could be worth much more for some lucky customers. Thanks to the generosity of McDonald’s • Siegfried Enterprises, Inc., each 2015 pin comes in an envelope with a pin prize entry form. GRAND PRIZES include: one roundtrip airline ticket courtesy of Southwest Airlines; commemorative item from the Pro Football Hall of Fame; 10 three-foot party subs from J & K Subway (valid in Stark County); a pizza-per-month for one year from Pizza Hut; a gift basket of Pepsi products from Pepsi Beverage Co.; a commemorative Enshrinee football; and a commemorative stein from the Pro Football Hall of Fame Enshrinement Festival. In addition to these prizes, the pin envelope includes coupons for various food and beverage discounts, as well as discounted admission to the Pro Football Hall of Fame. Entry forms must be completed and returned to the Canton Regional Chamber offices by 5 p.m. on Friday, Sept. 18, 2015. Mailed entries received Saturday, Sept. 19, or later are not eligible. Winners will be drawn and announced on News-Talk 1480 WHBC AM on Tuesday, Sept. 22, between 7 and 8 a.m. No purchase is necessary to win. For a complete list of rules and regulations or to request a blank entry, contact the Enshrinement Festival office at (330) 456-7253. The current and many past years’ pins can be purchased at the Enshrinement Festival office at the Canton Regional Chamber of Commerce, 222 Market Avenue North, along with a variety of other souvenirs and gift items, including golf shirts, t-shirts and caps. These items will also be available for purchase at all Enshrinement Festival events.